As I type this post, it’s the end of the weekend following Thanksgiving, and the last weekend of the month of November. For many families, this is the weekend their home gets decorated for Christmas! While it probably would have been nice to share this idea with you just a little sooner, I personally prefer to get past Thanksgiving, before I can (or even want to) focus on Christmas. That being said, there still are several days to spare before the first of December is here, so you still have time to do this simple and beautiful idea, for a Christmas Advent Calendar in your home. This idea is something I created two years ago, and I thought I’d share it with all of you, in case it’s something you’d like to try for your own kids. 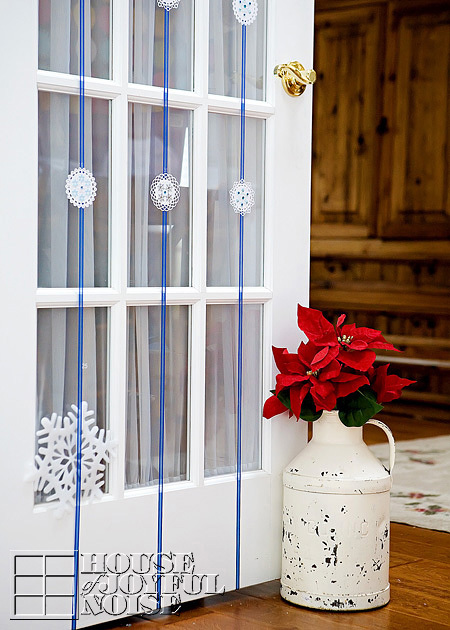 If your a frequent visitor here at our blog, you may have seen us decorate our french doors like this before. 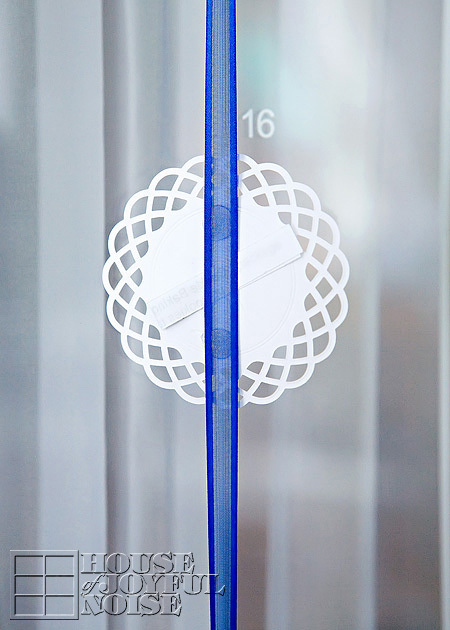 Using door length ribbons, and placing a decorative element on the ribbon strand in each window, I call these ‘fancy strands’. I’ve made them for the season of spring, and also Halloween. 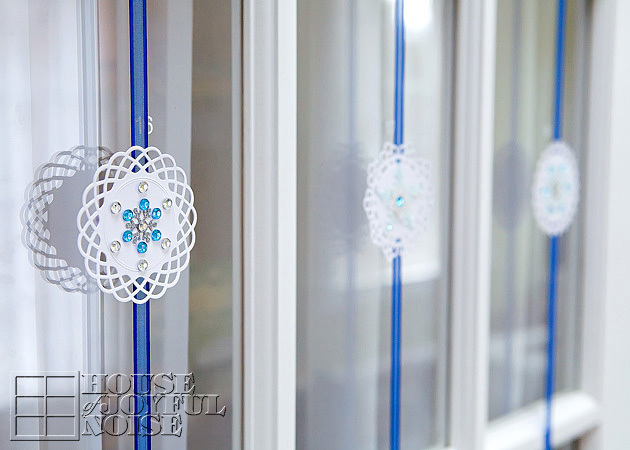 So this project started out with the same single intent of dressing up our French doors, in this case for the festive season winter, but immediately turned into the idea of using it as a home Christmas Advent Calendar for the kids. For us, December and the the Christmas Advent Calendar is not so much about the countdown until Christmas Day, but celebrating the whole season each day. This idea made every day really fun for our kids. 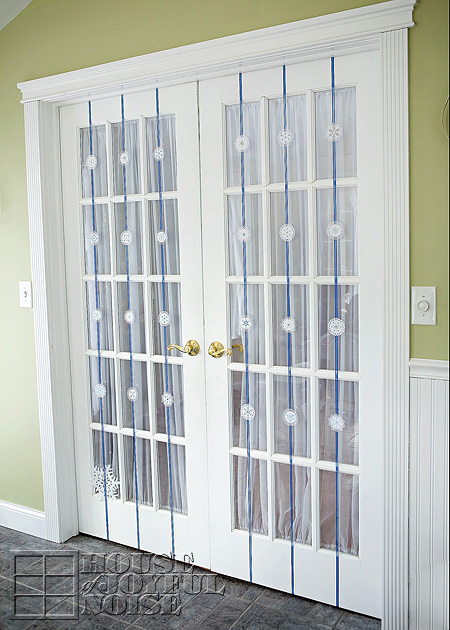 You don’t need French Doors in your home, to adapt this idea! 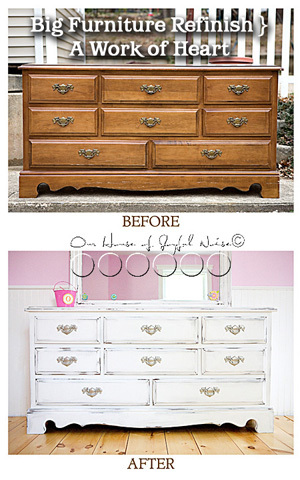 You can do the same thing using other areas or parts of your home. 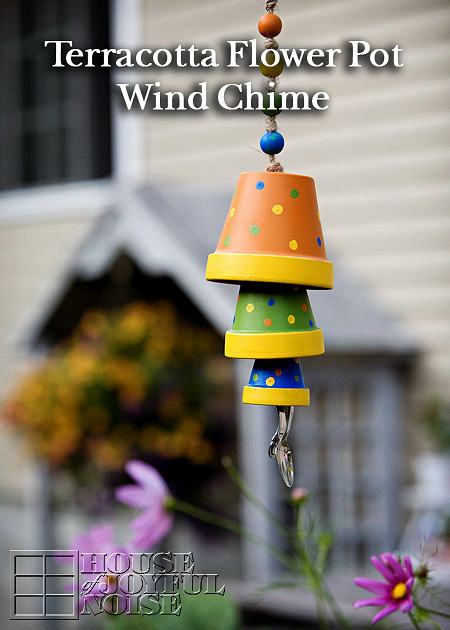 Some suggestions are using regular doors, a large wide window, the banisters of the stairs in your home, or even a wall. Look around your home and find your options, and then just make it work for you! In addition, you can create this using any theme or colors. 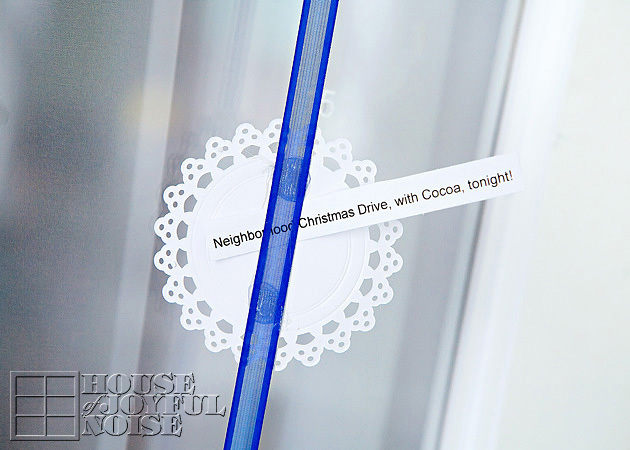 You may want to use red and green ribbon, with paper gift elements, or gold ribbon and ornament shapes. The theme and look of it is part of the creative fun. I wanted mine to work throughout winter. When Christmas was over, we simply peeled off the numbers on the windows, and the strands stayed through February or so. I’m going to tell you how I made this Advent Calendar so simply. The snowflakes were fun to make. I actually did not just buy them this way. 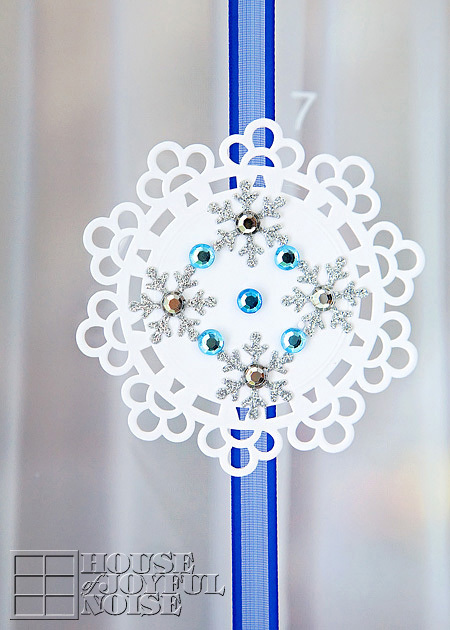 The white paper snowflake alone, are die-cuts I bought packaged loose, in the scrapbooking area at Michael’s Arts and Crafts. To give them some sparkle and make them more beautiful, I also found sticky some snowflake-ish elements of glitter and rhinestones, and put them together to make my own specially designed snowflakes. So easy and fun, creating each one! 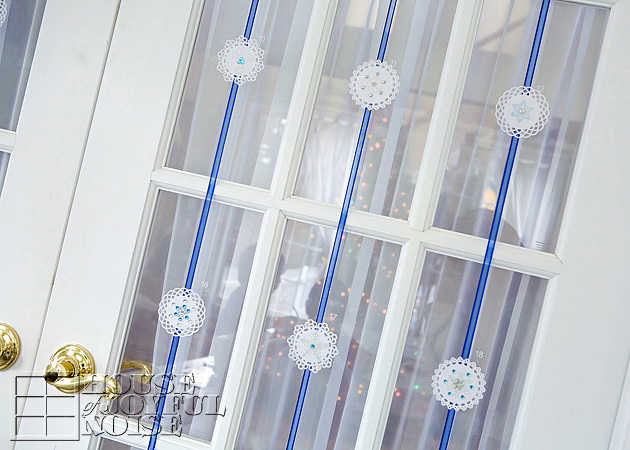 I chose blue ribbon for my winter theme, and placed a single 1-piece length from the top to the bottom (underneath) of the door, down each row of window frames of my doors. 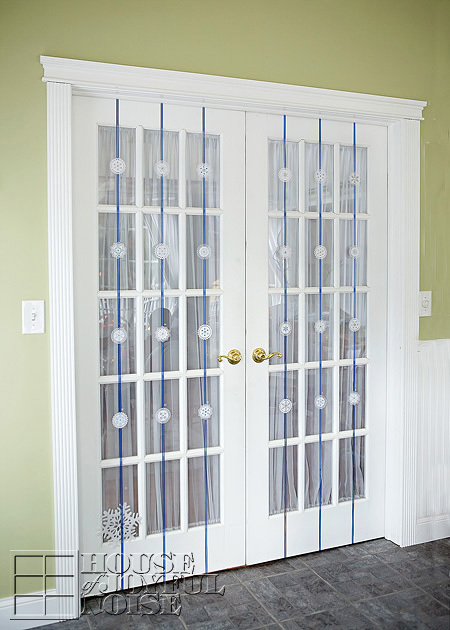 I measured the height of the doors, and made sure I bought enough ribbon spools for 6 whole full lengths. We have 30 window panes, so plenty for the 25 days until Christmas. 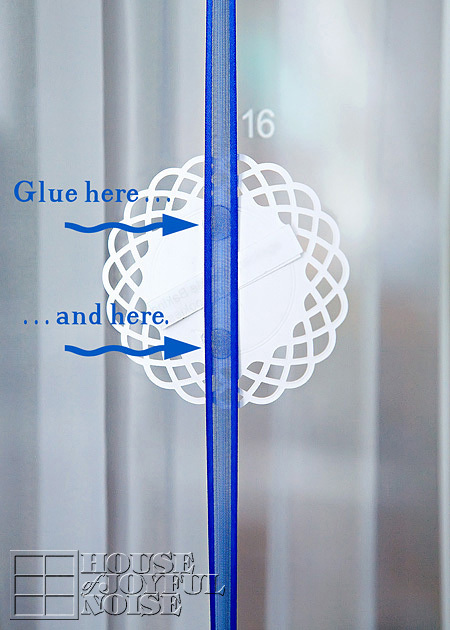 To number the Calendar for the days of December, we cut small white vinyl numbers, and simply put them on the glass besides the upper-right of each snowflake. However, if you are creating your advent calendar elsewhere in your home, the number can certainly be put ON the paper elements. 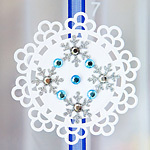 On front side of the snowflakes, it’s just pretty. But on the backside, it was designed to serve a purpose. 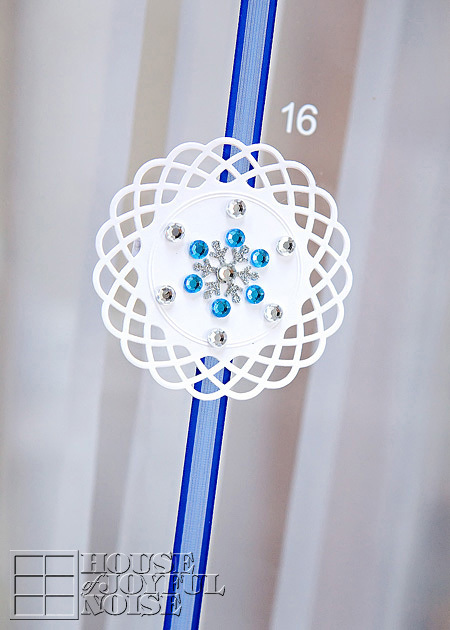 When attaching the snowflake to the ribbon, I was sure to put two dabs of glue; one at top of the snowflake, and one on the bottom, leaving a space without glue in between. Did you notice the little slip of paper slid under the ribbon? There was one for each snowflake, and each little slip expressed something different for that day. Again, we’re simple folks. 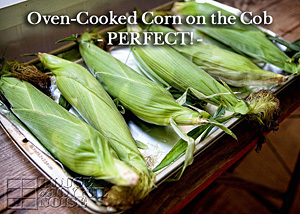 Our holidays are kept pretty simple too, and our days of any season are focused on faith and our family. For Christmas, it’s about pondering and celebrating Jesus’ birth, the time we spend together being creative, making things for others, and generally just having fun together as a family. So our slips of paper behind each snowflake reflected those kinds of things. Some were a surprise activity for the day: maybe a task for serving others. Some were a small treat, and others were a Scripture to remember and reflect on. A good variety of that kind of thing. Again, you can come up with what you want for your family, throughout the month of December, as you prepare for Christmas, and enjoy the season. Just type up a list in small print on your computer, skipping a line in between, print it out, and cut them into strips to fit behind your elements. The kids took turns taking out the slip and reading it to the others each morning. That way they knew what was in store for the day. It really takes very little to get our kids all excited. You would not believe the fun we have each year, just driving around neighborhoods checking out people’s home Christmas lights and displays, with our cocoa and snacks! 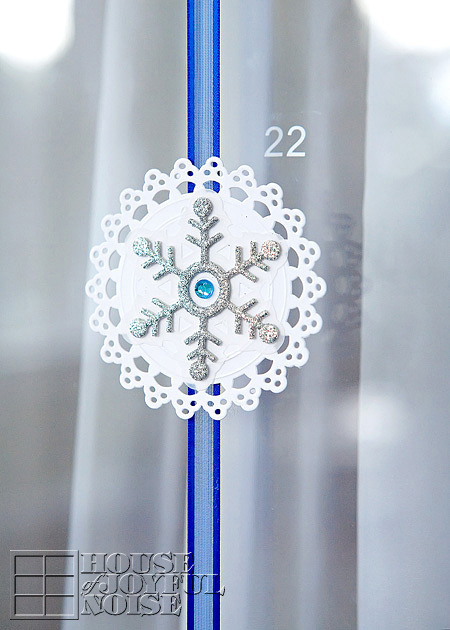 The big snowflake represents December 25th – Christmas Day. I thought it all came out very pretty, and of course the strands themselves are reusable again every year. It takes no time at all to cut out some new little numbers, and apply them. The slips of paper can be used again if they re saved as well. Mix them up, add new ones, or create a whole new set. I like to keep our kids on their toes. This Christmas season, make the most of every day with your family, and keep the spirit and love of what Christmas is truly all about, alive in your hearts and homes. We hope you find this idea inspiring. Thanks for coming by. Beautiful advent calendar! Creative coincidence… I did a ribbon roll up advent that’s going live tomorrow. We were on the same creative wave length and I love, love, love yours! Hi Carolyn! I guess we both just love Advent Calendars, huh? I’ll say it again; I really love YOURS! I honestly might just make it. Nothing wrong with multiple calendars in the house, right? It may not be done by Dec 1 this year but….I’ll forever have it. This is the prettiest advent calendar! Also, I just read your snowman ornament tutorial over at My Very Educated Mother and I LOVE it! 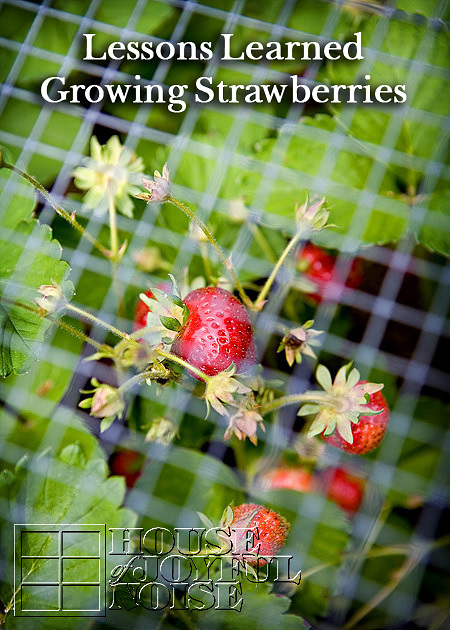 Terrific projects–thanks so much for sharing! Hey Shannon! Thanks so much! I can’t wait to share my ornament over here. Glad you dropped by. Following you on Twitter now! 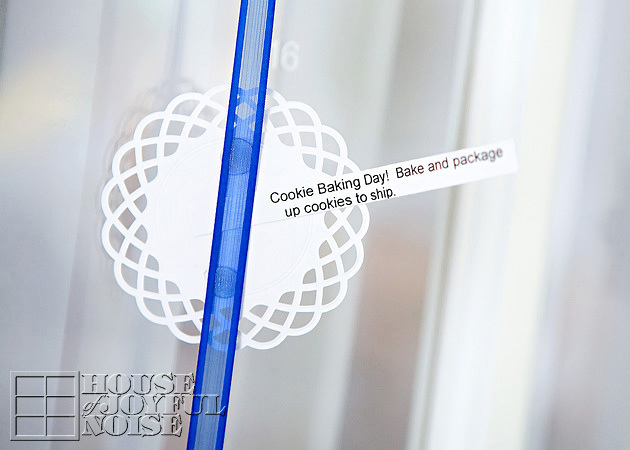 So pretty and such a great idea, Laura!